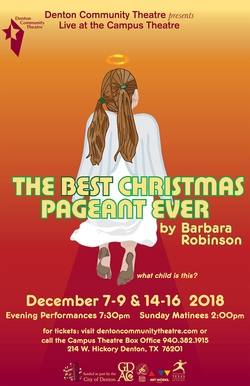 Denton Community Theatre is proud to present, The Best Christmas Pageant Ever, by Barbara Robinson, and directed by Nancy Chumbly. This delightful family comedy is about the Herdman children who attend church for the first time and end up in the annual Christmas pageant. These youngsters, all six of them, are well known for their delinquent antics and are generally thought to be a collective of walking trouble. The Christmas Pageant has always been a predictable staple of the church community with the same stern director, Mrs. Armstong. But the year that the Herdmans descend on them is also the year that Mrs. Armstrong is forced to bow out due to a broken leg. An inexperienced volunteer, Grace, steps in and hilariously, nothing is predictable after that. The Ladies’ Aid Society heartily disapproves, the shepherds quit the show, the name of the production is briefly changed to “Revenge at Bethlehem”, and the church catches fire. But something special takes them all by surprise as they watch the familiar story be revitalized by the undeniable creativity and unforeseen sincerity of these misunderstood siblings. Bring your family and join the Herdmans, their fellow pageant performers, the adults who try to manage them, and an angel choir for this production of The Best Christmas Pageant Ever. Performances are December 7, 8, 14, 15 at 7:30pm and December 9, 16 at 2:00pm at the Campus Theatre located at 214 W. Hickory, Denton. Ticket prices are $22 for adults, $18 for seniors (62+), and $15 for students (through college).